When carbohydrates are broken down during digestion, glucose (blood sugar) is produced. This increased level of glucose triggers the pancreas to produces insulin, which enables the glucose to enter the cells and provide energy for the body. Diabetics, however, don’t produce enough insulin, or the insulin that is produced doesn’t perform properly. The result is too much sugar in the blood, and that leads to a whole host of other problems. When a person has diabetes, any other ailment or non-optimum condition can be made worse. Here are some of the more common conditions so affected. When your body becomes ill, or you contract an infection, glucose levels rise in response to counter the illness. A non-diabetic’s body produces more insulin in response to these raised glucose levels. 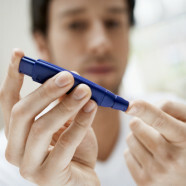 A diabetic, on the other hand, is unable to produce insulin to counter the raised glucose levels. Blood sugar levels then rise. This impaired ability to fight illness can make having the flu much more serious and could require hospitalization or result in death. Some skin infections are intensified by diabetes. Bacteria or fungus thrive in a sugary environment, so any infection will be harder to treat due to this factor. Insulin shots can cause problems with the skin at injection sites. Hypertrophy occurs from using the same site for insulin injection repeatedly. Atrophy is a condition where an indention is created at the injection site due to fatty tissue loss, which can negatively affect how the body absorbs insulin. Allergies to the adhesive that secures insulin pumps to the skin or reactions to specific types of insulin are another source of skin conditions made worse by diabetes. Itching, swelling or much more severe symptoms can occur. Individuals with diabetes are at a greater risk of eye and vision problems than people who do not have it. Glaucoma, cataracts, and retinopathy are the main areas of concern, and avoiding blindness is a primary focus for diabetics. Your kidneys have the job of getting rid of waste produced in the body and maintaining a proper balance of fluids throughout the body. Diabetes can cause damage to the blood vessels of the kidneys. The result is more damage and stress to the kidneys, reducing their ability to filter waste and regulate fluids. If kidney disease or damage is extreme, the result can be kidney failure.